He said the council had decided to issue the fatwa although the Health Ministry is still waiting for the experts to decide. KUALA LUMPUR: The National Fatwa Council has ruled that smoking e-cigarettes is forbidden in Islam (haram), said its chairman, Profesor Emeritus Tan Sri Dr. Abd. Shukor Husin. He said the e-cigarettes are dangerous, wasteful and harmful to health, Utusan Malaysia reported. “So, with all the three reasons, we say it is haram,” Abd Shukor was quoted saying at a press conference after the Perak Syariah Malaysia 2015 talk, yesterday. He said the Islamic edicts or fatwa was issued based on the council’s stand on shisha smoking. “We have discussed on cigarettes and shisha and we can equate them with vape. We have decided and there is no problem in this matter,” he was quoted. Health Minister Datuk Seri Dr S. Subramaniam had last week said smoking using the shisha and e-cigarette or vaping methods should be temporarily stopped until the findings on the risks are announced in two months time. He said his ministry was in discussions with various agencies and related parties to get their views on the effects these methods of smoking have on health. 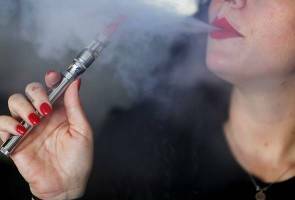 'Vaping' boleh menyebabkan kanser, sakit jantung?